People may wish to discuss the election result, so here’s a post for that. The Conservatives have 318 seats, and it looks like they will form a government with support from the DUP (10 seats) that will have a small overall majority. Theresa May seems to be hanging on as leader, though it’s hard to see how she can stay for long having taken such a disastrous gamble and run such a poor campaign. Kudos to YouGov, who stuck to their projection that was way out of line with the others but turned out to be one of the most accurate. So perhaps the only winner here is Michael Gove. Doubtless the pollsters will find excuses for getting it wrong, as they did last time. Maybe more young people turned out this time, or maybe more Kippers switched to Labour than anticipated. There was a big drop in the Green party vote, from 3.8% in 2015 to 1.6% this time. Apparently the DUP has a sceptical view on climate change so that’s bad news for greens too. George Monbiot is unhappy. Over the weekend, Theresa May carried out a relatively minor reshuffle of her cabinet. For fear of whose feathers she'd ruffle. Michael Gove, who was fired from his role as Justice Secretary by May less than a year ago, is now back as Environment Secretary. This has upset the Guardian, twice, who say that he tried to get climate change removed from the school curriculum, and that he’s “entirely unfit” for the job. His voting record on environmental issues shows that he has generally voted against regulations to reduce carbon dioxide emissions. Andrew Montford remarks on the outrage of the green blob. Larry (see photo above) stays on, apparently. If the”greens” are losing ground and Moonbat is unhappy then the election does have a silver lining. In all seriousness this to me is the first British election controlled by Isis. The emptiness of May’s leadership in the face of multiple assaults left the voter with few reasons to vote. May has traded a few seats for a personal mandate for her as PM (which no challenger would have) and in the process has effectively sidelined the SNP, Lib Dems and UKIP. Not as good as hoped but she had the DUP in reserve to help out if necessary. She now only has to wait a while whilst Labour shows its true colours over coming months. After that, she should prevail. She did win and now has the personal mandate that was previously lacking. “And whether or not it is clear to you, no doubt the universe is unfolding as it should. Therefore be at peace with God, whatever you conceive Him to be. And whatever your labors and aspirations, in the noisy confusion of life, keep peace in your soul. With all its sham, drudgery and broken dreams, it is still a beautiful world. Be cheerful. Strive to be happy”. It would have helped with our negotiations if she had a thumping mandate but we’ll see. Article 50 has been triggered. Britain will ‘leave’ the EU, although under what terms is anybody’s guess right now. David Davis is already talking about membership of the Single Market being back on the negotiating table. Personally, I think him and May should step down. The DUP being ‘climate deniers’ is an unexpected silver lining I must say, but they don’t seem to be too keen on breaking ties with the EU as far as trade is concerned. The default outcome of this mess has to be that freedom of movement will continue for years, the UK will be restricted in negotiating trade deals with non-EU countries and we will continue paying vast sums of money into the EU’s unaudited coffers. Uninspiring. Save us Nige! Predictably, both the Grauniad and the Indy already have articles attacking the “climate deniers” in the DUP. May clearly overbid her hand and didn’t have enough points for game. In particular she misjudged Corbyn portraying him as some sort of incompetent ogre unworthy of any respect. What many people increasingly saw instead during the campaign was a decent man sticking to his principles (which might be different from ours) and whose party put out a costed manifesto. Whereas his main opponents couldn’t be bothered to provide figures or, in some cases, even turn up. Yes the youth were bribed, but then so were pensioners in a spectacularly destructive U-turn. In case you’re wondering, I didn’t vote Labour. In my constituency, which has been Tory held with staggering majorities, any such activity would be known as WC fodder. I did, however, exercise my franchise. I wish there had been a Rhinoceros Party to vote for, which in Canada advocated a change back to left-hand driving (lorries and trucks to change over first for a trial period). On Teresa May’s new Democratic Unionist partners, the Sky News reporter said (from memory): “They’re anti abortion, not too keen on GLBT rights, and climate deniers.” The Guardian’s article, under the headline: “From climate denial to abortion: six DUP stances you should know about” manages to link climate denial to creationism. Some years ago there was a whiff of scandal around the DUP and a boys’ school or orphanage, I remember. Hasn’t anyone made the link between climate denial and paedophilia? The BBC would but as they’ve just seen another pair of employees jailed for abusing teenagers, they’re probably not in a stone throwing mood. One bright spot of the day is the students and celebs massing at downing street to demand May resign. I’m fairly sure that Boris isn’t who they’re thinking of for a replacement and still don’t realise that Labour didn’t win. A disappointing result, to be sure. But thank your lucky stars that you’re in Great Britain – not British Columbia where the results of last month’s provincial election were far closer and the future, alas, far more uncertain. Now-former IPCC-nik & climate modeller, Andrew Weaver (who’ll sue you for “defamation” if he and/or his legal beagles don’t like what you write about him) holds the “balance of power” after increasing his Green Party standing/sitting from one (himself) to three. Weaver chose to ally with the (BIG spending) NDP – rather than the Liberals (who in this province are far closer to conservative than their similarly named federal counterparts under “let’s bring in lots of unscreened immigrants who speak neither Official Language, implement a national “carbon tax” and send $billions to the UN” PMJT). After a recount in some ridings (which sadly didn’t change anything) the 88 seats ended up with Libs: 43, NDP 41, Greens 3. The Libs are hanging on for now, but much will depend on whether anyone from Premier Christy Clark’s party will agree to serve as Speaker. The legislature cannot conduct any business until a speaker is chosen! Weaver was instrumental in saddling this province with the equivalent of your nonsensical Climate Change Act (sorry can’t remember the actual name). One of the major points of contention today is a multi-billion $$ Site C hydro dam, the construction of which is now well underway following approval back in the day when Weaver had the ear of then (Liberal) provincial premier, Gordon Campbell. Interestingly, Campbell recently indicated he still thinks the project should continue to go ahead; but Weaver & (NDP’s) Horgan want to stop construction, thereby putting a few thousand people out of work while they reinvent the approval wheel. Canada might not be using them but it’s got a lot of resources. Our greatest resource just voted for Corbyn. Don’t know what the problem is, thousands of us oldies are getting together to invade Trafalgar Square tomorrow and shout, “Its not fair” and throw our dummies out of the pram. Additionally Gina Miller has yet to pronounce on the result so we’re not clear if its legal or not. What we’ve ended up with is a mildly left-of-centre Conservative government who will likely get on with the job of governing sensibly without any fancy tricks. A bit like John Major with Ken Clarke as Chancellor. May had no good ideas when she was looking at a large majority, and thus doesn’t deserve one. Her job is now to place a steady hand on the tiller for several years while Brexit is done, something Corbyn supposedly agreed to go along with. The DUP are useful to have as allies because they will vote straight up and down with the Government most of the time and are absolutely not interested in the global-warming green twaddle. That is a big plus; the Green vote has collapsed and a long period of silence from its strident proponents might well be approaching. Realistically, it was always going to have to die a slow death anyway. We are already familiar with the DUP’s other issues and where lines-in-the-sand would be drawn, so they should be reliable known quantities for a Conservative government. Frankly, it’s about time the Irish protagonists acknowledged that there is more that unites them than divides them. They’d have to come up with something special to appear worse than Islamic terrorists. As it stands, NI is likely to get continuing favorable economic disbursements from a UK government if they don’t rock the boat. Government is often better when it appears dull and no single grouping gets indulged in fanciful excursions of how they are going to change society or save the planet. I think it’s worth noting who’s not an MP in our hour of need: Nigel Farage, George Osborne or Ruth Davidson. The last two would have had a real shot of becoming PM. But there we go. So perhaps the only winner here is Michael Gove. The context was expert failure, which has indeed been spectacular and hilarious in the last 24 hours, on all sides. But there are also currently rumours of a comeback for Duncan Smith, Gove and one of the ex-justice minister’s most loyal and intelligent sidekicks, Dominic Raab. I think the country would be the winner if so, as well as this blog’s concerns for climate and energy realism. The numbers remain interesting in all kinds of ways. Lastly it would feel ungenerous for a climate sceptic not to congratulate Piers Corbyn and his younger brother at this juncture! Larry looses his mousing majority. 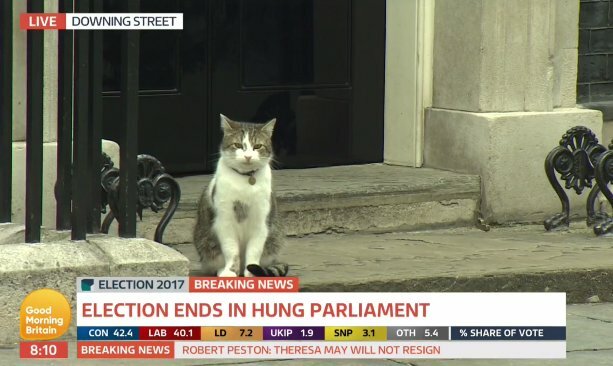 Should of course be “Larry loses his mousing majority”. Over the last few weeks I first tried forecasting the local election results in England, Wales and Scotland, (where I did fairly well, especially for the Conservatives) then tried to forecast the General election results and did badly. In the Welsh local election results I forecast 80 Conservative gains, the exact figure. I had stuck with my Welsh forecast, despite a Yougov / ITV poll that forecast a huge leap in vote share for the Conservatives, which would have implied a gain of over 200 council seats. It did not seem right. In the General election forecast, made on Wednesday evening, I rejected the YouGov forecast. It seemed that other forecasters were adjusting their assumptions to the YouGov one. In forecasting a 76 majority I followed an emerging consensus, which agreed with my belief that no sensible person would vote for the party of Jeremy Corbyn and Diane Abbott, given (a) their past beliefs (b) their media interviews (c) their policies, which repeated the failures of the past. I was unaware of the twitterati, who block out alternative points of view and the huge numbers who came to Corbyn’s rallies. His moralistic speeches can sound quite plausible to a receptive audience, where assumptions go unchallenged and weaknesses (such as on Brexit and Trident) are glanced over. In other words, my failure was to follow a consensus that agreed with my own views. I could not have done better, as their were good reasons to be sceptical about the data coming in. It might be possible to “forecast” with hindsight, but that does not help. What has happened in politics is that the underlying structures have changed in voting behaviour, making forecasting results very difficult. That is, like economic forecasting, the accuracy of the forecast is inversely related to utility of that forecast. Brexit and Corbyn have changed the political landscape, like the credit crunch and the oil price hike of 1980 changed the economic landscape. In the case of the election, it would have been to say why a forecast was difficult, rather than trying to forecast. – referencing consensus opinion, rather than real world data or coherent argument. – having false views about the motives of opponents rather than admitting other valid views are possible. – failing to see assess the effectiveness of policy proposals, and the potential harms that they will cause. Kevin (manic): One of the deepest analogies I’ve seen drawn to seek to explain our climate/energy problem. Precisely because it comes out of honesty after personal prediction failure. We must come back to it. Tory HQ’s war room was all set for Queen Theresa’s coronation celebration when the young female aide saw the disastrous exit poll — and retched in shock. That’s from Anthony Lane’s account of the campaign in King James lingo in the New Yorker on Friday. Lane nails much, not least the inter-generational challenge we face, about which I was exercised in January, and which certainly applies across all of climate and energy. Again, I hope we come back to it. Just in – Gove as Environment Secretary! How sceptical is he? Comes over rational…. Osseo, thanks – post now updated to mention Gove, who seems to be moderately climate-sceptical.